The early medieval Church Stipshausen was demolished in the second half of the 18th century and replaced by a new structure, which was dedicated in 1778. The "new" Stipshausen Church was the same as the neighbouring Schauren Church in structure as well as the interior decoration. 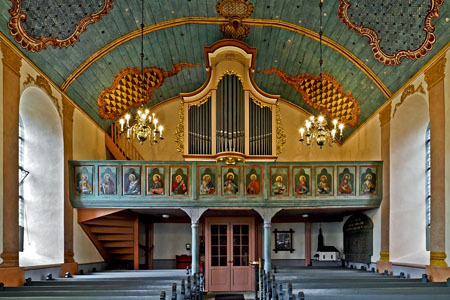 Both churches not only have a valuable Stumm organ made by the organ building family from Sulzbach am Idarwald (from 1779 and 1780), but another point of interest is the Late Baroque decoration of the heavens made of wood. The paintings in the gallery document folk art imbued with a deep sense of piety. In Stipshausen Church there are 13 pictures on the front of the gallery representing Jesus with his 12 apostles. Stipshausen naturally has much more to offer; it not only lies on the "German Gem Road", but also on the Sirona trail, named after the Celtic-Roman goddess Sirona. Stretching over 100km across the Nahe-Hunsrück region, this trail links a variety of sites of cultural interest from Celtic and Roman times that are well worth seeing. An information centre in Stipshausen shows the stops along the trail where there are ring walls, Celtic refuges, hill tombs, reconstructed Celtic villages, and Roman villas and temples. This means that one can view traces of historical settlements of the region from the 6th century B.C. to the 5th century A.D.